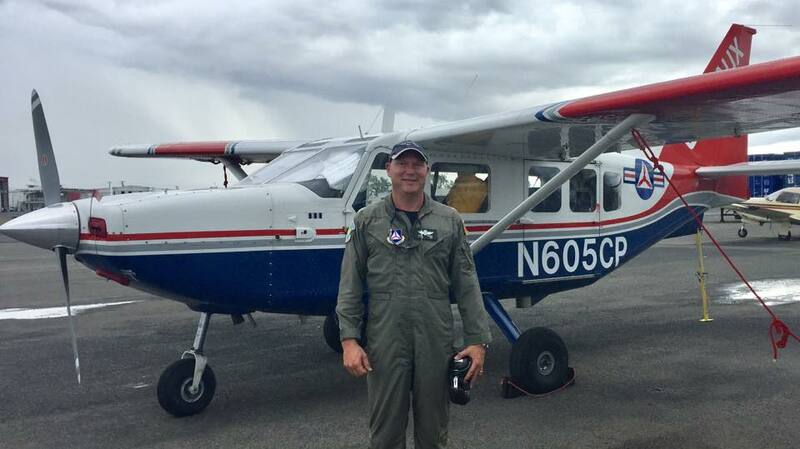 10/28/2017–BURLINGTON, NC–In the weeks since Hurricanes Irma and Maria devastated Puerto Rico, Civil Air Patrol (CAP) pilots from around the nation have gone to help. Their mission there is to fly aerial photographers taking recon photos, so FEMA and the Army Corps of Engineers can identify what areas need aid most urgently. The results are powerful images from a bird’s eye view. Lt Col Dion Viventi of the North Carolina Wing returned in late October from a seven-day CAP deployment to Puerto Rico. While there, he piloted 2 flights per day with aircrew members from CAP’s Puerto Rico Wing. And the flying itself is challenging. Although he’s been a CAP pilot since 2001, Lt Col Viventi said the Puerto Rico mission was the most challenging mountain flying he’s ever done. “Puerto Rico has very mountainous terrain with low cloudy ceilings. And the rainy days made visibility even worse.” Lt Col Viventi credited attending the NCWG’s “Mountain Fury” mountain-flying training with helping him prepare for the mission. The CAP planes were also sharing the airspace with helicopters from numerous government agencies also on disaster relief missions. So everyone on the flight crew had to be alert at all times. Lt Col Viventi is from Elm City, NC, and is a member of the Tar River Composite Squadron. When he’s not volunteering for CAP, he serves as the Director of the Rocky Mount-Wilson Regional Airport. As the Puerto Rico mission proved, the North Carolina Wing is prepared and ready to support disaster relief missions whereever needed.